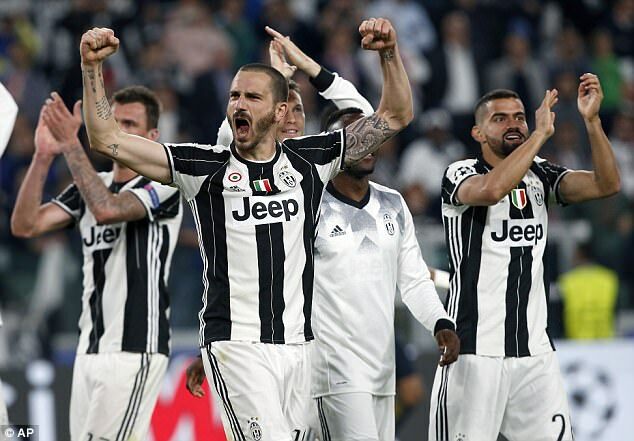 Leonardo Bonucci admits Juventus will likely need to produce their ‘best performance of all time’ to win the Champions League in Cardiff next month. The Serie A giants reached June’s final, where they will play either Real or Atletico Madrid, after completing a 4-1 aggregate semi-final victory over Monaco with a 2-1 win in Turin on Tuesday night. 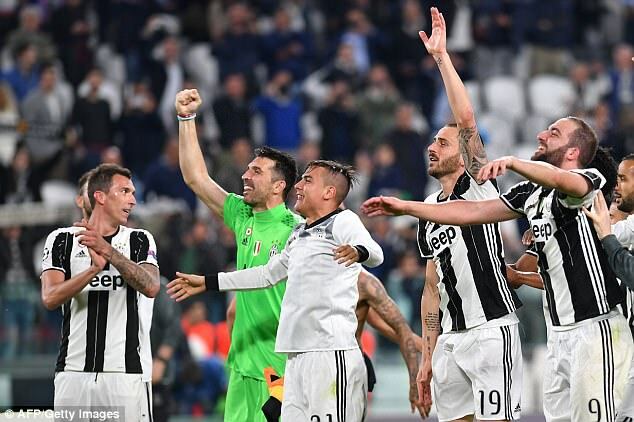 Goals from Mario Mandzukic and Dani Alves confirmed Juve’s dominance over two legs and they will now get a chance to make up for their final defeats by AC Milan in 2003 and Barcelona in 2015. 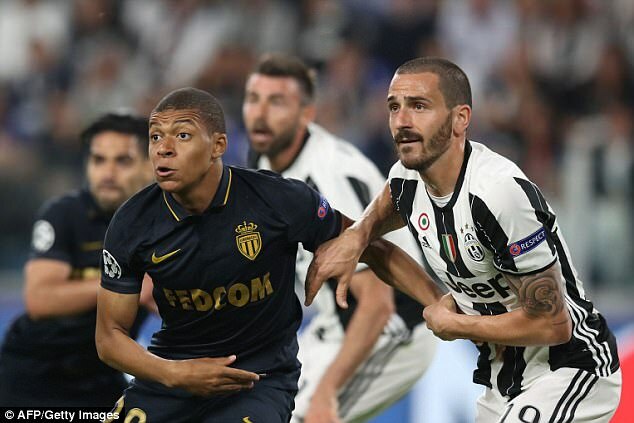 Ball-playing defender Bonucci, on the losing side when Barca triumphed in Berlin two years ago, felt Kylian Mbappe’s goal at Juventus Stadium served as a warning ahead of the showpiece in Wales. Until Monaco’s 18-year-old striker scored in the second half in Turin, the Bianconeri had kept a clean sheet in Europe for over 600 minutes. Sevilla had been the last team to beat Gianluigi Buffon, back in November’s group-stage victory at the Ramon Sanchez Pizjuan. Bonucci told juventus.com: ‘It’s a shame about the goal we let in. We shouldn’t be conceding like that just because we switched off. We’d taken our foot off the pedal a bit at that stage. ‘That’s something we need to improve on. We can’t take anything for granted because at this level you only need to make one mistake and you’ve let in a goal. ‘Still, we’ve shown what a great team we are and we’ll be going to Cardiff to win, aware of our ability. ‘We had a fantastic midfield when we played in Berlin, but I don’t think we’re any worse off this season. Our midfielders are perfectly suited for the formation we’re playing and we’re very comfortable with it, too. Juve last won the European Cup in 1996, beating Ajax on penalties in Rome, but they failed to retain the trophy as Borussia Dortmund triumphed in the Munich final 12 months later. Twenty years on they are better than ever, with a sixth straight Serie A title within reach on Sunday, should they take a point at Roma. They will also face Lazio in the Coppa Italia final. Bonucci added: ‘It’s a superb result for a team that’s heading into the business end of the season still challenging on all three fronts. Monaco, who twice beat Tottenham in the group stage before knocking out Manchester City and Dortmund, can now focus their efforts on trying to win a first Ligue 1 title since 2000. Mbappe has been this season’s revelation both at home and abroad, reaching 25 goals in all competitions with his consolation effort in Turin, and he is grateful for the experience. He told asmonaco.com: ‘We came fully armed and wanted to make it difficult for them. ‘It was not enough but we left with our heads held high. My goal was useless but there can be no regrets about this European campaign.